Quest Soccer Camp can help them find out! 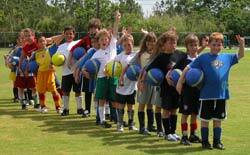 Right here in Ft. Pierce, a soccer tradition has begun, and your child can be a part of it. In just one week, our expert instructors led by Quest Soccer Camp Coordinator Ron Basile will provide a solid footing in soccer fundamentals, giving your aspiring star the skills to help them become a better and more proficient player. We strive to help your child excel on and off the field, with special emphasis on the camaraderie of team play. The Quest Soccer Method crafts a program geared to all skill levels, while making sure campers learn in a safe and fun environment. The Quest Soccer Camp has emerged as the premier soccer camp in Ft. Pierce. 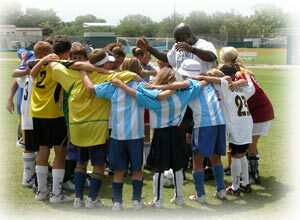 Ron Basile and his staff at the Quest Soccer Camp have steadily continued to bring their absolute best soccer instruction to the youth of Ft. Pierce. We invite you to explore all the pages of our website and come to know us and experience our commitment to the soccer community. Come witness our commitment to the community off of the field by visiting our charitable partners via the boxed links on this page. This year we have re-named the REACH Scholarship in honor of our former instructor, Jenna Johnson, who passed away in 2006. We have joined forces with the "Draw a breath" and "Soccer kicks for Cancer" organizations. Quest soccer continues to reach for the best in us so we can give you our best. We invite you to learn more about our camp, and how we can help give your child a fun-filled, rewarding and truly affordable experience.